There was so much of hope, at least amongst the ordinary folks, that Field Marshal Sarath Fonseka would be appointed as Minister of Law and Order. The logic behind such hope is quite legitimate and sound. Sarath Fonseka, when he was the Commander of Sri Lanka Army, delivered the goods. Fighting against one of the most dreaded terrorist armies in the world, Liberation Tigers of Tamil Elam (LTTE) and its charismatic leader Prabhakaran, Sarath Fonseka not only exhibited raw gallantry and bravery, he displayed his acute knowledge about modern-day terrorist warfare and strategic battling on the field. He never sent his men and women where he couldn’t go himself, a characteristic of a charismatic leader. He may be detested by the Tamil Diaspora. He is certainly feared by our politicians, amongst whom are the Rajapaksas who were quite comfortable to give orders from their air-conditioned rooms in Colombo. Battlefield experience is a rare quality. Those who gather such experience, especially as battle field commanders are even rarer. That is why all over the world, those who excel as winning commanders end up capturing most lucrative civilian jobs in any administration. Whether it’s in the democratic West or any other administration in the ‘Socialist’ world, Russia or China, such men and women end up occupying very commanding positions in the civilian managements of governing affairs. As far as Sarath Fonseka is concerned, he seems to be in a unique position in that, he was dreaded by the Rajapaksas and went after his blood in no uncertain manner. The current leaders of the government, whose original election pledge on election platforms was to expose the Rajapaksas and bring about law and order to a society so corrupt and placid, seem to be fearful of Fonseka’s ability to just that- elimination of corruption and bringing a sense of sensibility and order. The recent eruption of ethnic violence and racial mayhem in Kandy district cannot be disregarded as a minor clash between two clans. Minimizing a looming danger is a trait of a coward. For he or she thinks that such treatment would place him or her in a comfort zone within which they feel quite secure and safe. Such men and women do not dare. They don’t venture outside the proverbial ‘box’, the comfort zone. The current government seems to be glued to that comfort zone. Sri Lanka’s post-Independence history has known only a very few leaders who dared to venture outside the box/comfort-zone. Such men changed the course of the nation’s journey. Whether that change of course was for the good or bad is a different argument altogether. Future historians will pass judgment on them. Yet such change of course, if initiated in a timely manner, by credible leaders whose daring and idealism were more precious to them than political expediency, could shape and define the character of a nation which would embrace such a character as an alternate personality. However, if this alternate personality of a nation is to be sustained for a calculable time of its journey, a great process of education and information, independent of political ideology, needs to take place. That process will not happen overnight nor would it occur as a matter of course. It needs to be deliberately engineered and monitored from a center. That is precisely where a fully focused mind like that of Sarath Fonseka comes to play. Great devotion to the task at hand and unimpeachable commitment to the end-goal is a prerequisite for any candidate to be responsible for handling the Ministry of Law and Order. That dedication and commitment is not forthcoming from any personality in Parliament today except from Field Marshal Sarath Fonseka. Any person in my personal opinion, who could offer some competition in the sphere of commitment to a task and being focused, is Navin Dissanayake, the Minister of Plantation Industries and elder son of the late Gamini Dissanayake. Such men with a sense of urgency and undeterred sense of results-orientation are few and far between. It is even more so in post-Independent Sri Lanka. That is another tragic feature of our storied nation’s history. Reverting to the current context, the recent turmoil in Kandy district and its assumption of racial tones coupled with the prelates of Maha Sanga being silent on the initial involvement of the likes of Galagoda Atte Gnanasara and other thugs in saffron robes, have aroused the appetite of tour global partners to warn their citizens to be more discerning when travelling to Sri Lanka. This consistent process of intended or unintended intervention into our internal affairs under the facade of human rights will continue. The dishonorable genocide committed in 1983 is still fresh in the human rights-activists world over. A totally different mindset is necessary in the present set of circumstances. A mind that is bold, a mind that is not scared and a one that is fundamentally results-oriented and unrelenting is the need of the hour. If Sarath Fonseka is that mind, why is everyone scared of him? A soldier who nearly sacrificed his life during the war with the Liberation Tigers of Tamil Elam (LTTE), a Presidential Candidate who dared challenge the Rajapaksas in the 2009 Presidential Elections, almost single-handedly with lukewarm assistance from the Unite National Party (UNP), cannot be discarded as an unwelcome guest? The problem lies there; the issue with Fonseka is that no one in the other political parties could come anywhere near his achievements. A singular sense of envy and fear has overwhelmed our Sinhalese politicians. One can understand the fear and dread that stems from the Rajapaksas for Sarath Fonseka; but the fear and jealousy others seem to have is unpardonable. Fonseka’s capabilities are beyond question. As at now, he is rotting away in a Ministry that has no portfolios. It is a travesty of national proportions. The writer does not to intend to belittle Ranjit Madduama Bandara who has just been sworn in as Minister of Law and Order. But to compare the two, Fonseka and Madduama Bandara is not fair by both of them. The current government has failed miserably on the very platform that they were elected to office on. The unmitigated condition of bringing justice to those who played out the coffers of the treasury and conducted crude and inhuman acts of violence and viciousness towards those who protested against their regime is still not fulfilled. It is that condition the majority of the country wanted satisfied. The majority of the people in the country know that Sarath Fonseka, more than anyone else in the current administration, is the person who is qualified to undertake that brutally honest task. Then why not ask him to do that? If the Rajapaksas come out clean after swift and justly concluded inquiries, then that is also alright. But dragging these inquiries without any end on the horizon only strengthens the Rajapaksas and weakens the government’s hand. On the other hand, a wakened hand at the beginning of the inquiries has further eroded the confidence of those who are eagerly looking forward to a rapid finish to the nagging questions that surround the last regime. Obviously the untoward laziness which was displayed by the government-led inquiring officers and those who matter in the Department of Attorney General during the last two and half years definitely was factored in by a sizeable majority of the voters in the local government elections and the results confirmed that. The context is very clear. It is as crisp and unambiguous as crystal. Within that vast yet well-defined context, rejection of Sarath Fonseka’s name for the Ministry of Law and Order is unfathomable. Our politicians have not learnt to sacrifice their personal agendas for the good of the country. Nor have they learnt the fine art of negotiation- a craft that is essentially having a bind and abiding attachment to detach oneself from the immediate advance or retreat. Such nuanced politicking has lost its way. One can understand if those who reject Sarath Fonseka are uneducated nincompoops. But when such opposition stems from the educated quarters, it’s quite evident that something more than a calculated gamble is at stake. Once again, it may be redundant to emphasize the significance of seeing finality to the inquiries against the Rajapaksas and their cohorts. It may also be redundant to say that no one other than Sarath Fonseka in the current government has the curriculum vitae to take over such a job and produce results. The erosion of Sinhalese Buddhist votes from the UNP is evident. Election after election has shown that an overdependence on the Tamils and Muslims might backfire to such an extent, the net UNP votes might reduce to an abysmal few. The increasing numbers of independent voters who are not attached to any political party yet matter most, when elections are held, would undoubtedly go away for the UNP and seek refuge elsewhere. The writer is not of the opinion that Prime Minister would like to share the inglorious distinction with President, of presiding over the disintegration of his party during his leadership. Desperate and politically fed up men women of this country has tons of problems in law & Order to be resolved by the Field Marshal Mr. Sarath Fonseka . Even if he got it, he won’t be able to do it properly as per the current situation in Sri Lanka. Leaders of this country must have thought giving him a so much hot seat to him could be political disaster to his future politics. JVP is the only solution and I hope that everyone votes for them among the Sinhala Modayas next election. Bondscam Ranil Wickramasinghe, Mahinda Jarapassa, Gamrala Sira, and Avant Guard Gota who all looted Lanka need to be confined in the same prison cell. SF is from the army with brilliant credentials. Exactly what the country needs; an IRON FIST to get rid of corruption and the culture of impunity. The present “rulers” are a useless bunch of rogues hell bent on enjoying the perks of political power and enriching themselves; it’s time for a younger generation of rulers. The present spineless President has no future in SL politics; but he did save the country from a political disaster by winning the last Presidential election; it was an act of serendipity. There is nothing wrong in fearing a rabid dog. This mob attack against Muslims happened with blessings and planning of the government(Gnanasara is in president delegation in Japan).MR and team nothing to do with this attacks. (criminals are ruling the country under the goose of yahapalanaya)the theme yahapalana is western plot of new colonization,unfortunately this time our big brother India is part and parcel of western plot. Is Gnanasara in Japan with MS? OMG! Whether he is there or not should not be an issue any longer , for he has been paid his dues overly for the services he rendered for creating Aluthgama incident under the supervision and guidance of US and Norway, alienating Muslims , which in return helped zombie Sirisena to become the president of the country. Are you actually “Vishwamithra” or “Pissu mithra”? Your writing says, with no doubt, the latter title suits you perfectly. To the Daily Mirror or the Colombo Telegraph, you contribute nothing but empty long tails. On what ground are you proposing this twice-rejected by people individual to be in the helm of law and order in this country? Do you want us to believe SF’s ‘WHITE” as a lotus bud? Or his track record, as the minister for regional development, has proven his capabilities? If one is to felicitate for writing crap, no one is there to compete with you Pissu Mithra! Perhaps Thushara Wanni could give a fight but he’s far behind to you. I am not sure whether he is “Pissu mithra” or not judging by his articles he is definitely not a max moron. How was your Teldeniya days in Gnanasaras amude? For 30 years the excuse for no progress and problems was the war, but now the war is over, did anything get any better, NO, the reason is as the saying goes, ” you can take the man out of the jungle, but you can’t take the jungle out of the man”. What it proves to the world is that this race is a dead race, they cannot live and let live nor bring peace and prosperity to the mass, just because they are the majority, it doesn’t give them the right to rule, Ethiopia is ruled by a minority tribe. I guess we need a another war to put things right, divide the country equally along ethnic lines, and this time they will have the support of the whole world as they also see this as the only solution. PM could negotiate with president to appoint SF as law and order minister for him to step down and declare that he will not contest election again. This is the Best possible way forward. Hope our president is committed to the reasons why he was elected. PM bear more responsibility for eroding trust in this government . people are aware of some progress made but they have no meaning when corruption continues unabated at top level in this government. Please give this nation a space to breath some fresh air which people hoped for when they elected their president. 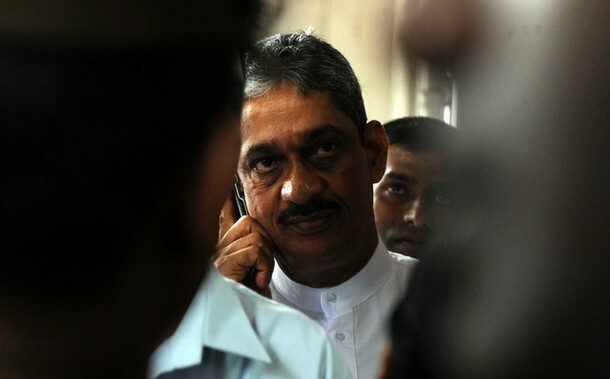 Sarath Fonseka was sent to jail for three years by the very same army he commanded, for financial crimes. Such a man, an ex-convict, was promoted to the rank of field marshal. This never happens in any army, worldwide. All other armies and nations are laughing at us. He ignored/allowed human rights abuses during the last days of the war, including shooting dead white flag carriers, and naked handcuffed rebels. This too never happened in any other war. The IGP and several DIGs have publicly stated that they do not want SF. The Armed Services have been molded to have the loyalty NOT to GoSL but elsewhere. As to whether Sarath Fonseka is ” Dreaded By The Rajapaksa & Feared By Everyone Else” is immaterial. The main reason why the President did not appoint Sarath Fonseka is because he did not want Fonseka to contest the next Presidential Election against him. Sirisena knows that if Fonseka is given the position he will within a short period of time would solve the major issue i.e. locking up murderers and rogues thereby become popular among voters. Also others will think not twice but numerous times to become rogues as they will be scared of Fonseka. Still there is time to appoint him. This President is TOAST;. No Political future for him; He dig his own grave. You mention that it was the hope of the ordinary folks . Surely 5000 deaf and dumb idiots , out of 21 Million shouldn’t be taken as the representation of ordinary folks in the country. Yes I have to agree on one thing. When he was Army Commander he delivered goods. But not in the meaning you try to depict. Kalawaddah (as fondly known to everyone) was (and still is) an ace class womanizer and he made lot of women soldiers DELIVER by force, which was an open secret in the army. It was this weakness that helped Prabakaran to send a seductive LTTE women to blow him up within his own territory. Even the security guards at the gate knew that she was Kalawedda’s keep and never bothered to check her as always. True to his Name Kalaweddah without an iota of brain to realize that he has been played for a sucker , chose to bite the hand that fed him and contested against MR in 2010, very similar to what zombie Sirisena did in 2015.